Temperature plays a very critical role in water intake in the young calf. Photo courtesy of Jason Warner. Many producers have found calving in late spring or summer allows them to match their feed resources to the cow’s nutrient requirements better than spring calving. Producers who choose to calve at this time need to also consider the water requirements of young calves during the heat of summer. Very little research has been conducted on the water requirements of nursing beef calves. However, data collected by Dr. Jim Quigley at the APC Calf Research Unit in Ames, IA on bottle fed dairy calves can largely be applied to nursing calves in the beef sector. In his studies, calves were 3-5 d old at trial initiation and about 60 d of age at termination. While several factors can impact the amount of water calves will consume, three main factors emerged as having the most impact. The amount of milk the calf consumes, the dry matter intake of feed the calf consumes, and mean daily high temperature were the factors having the largest impact on free choice water consumption. While it is difficult to know exactly how much milk a nursing beef calf is consuming, it is fair to say the amount of milk they get will impact their need for free choice water. Dr. Quigley’s research group determined calves fed 2.2 lb/d of calf starter and no milk replacer at 70°F consumed 1 gallon of free choice water daily. However, when the calves were fed 0.8 gal/d of milk replacer in addition to the starter feed at the same temperature, free choice water consumption dropped to 0.66 gal/d. It is interesting to note that even though milk replacer was fed at almost a gallon, water consumption only dropped by about 1/3. Dry matter intake is critical for the development of rumen function. Beef calves in a grazing situation can be seen nibbling at grass by 3-5 days of age. It is important to understand that due to closure of the esophageal groove during nursing; almost all milk will bypass the rumen and go straight to the abomasum. Drinking water will enter the rumen and promote digestion of solid feed in the rumen. Water intake and dry matter intake are highly correlated. Beef calves which start feed consumption early will gain weight quickly and tend to thrive. The Iowa dairy researchers found that dry matter intake explained more than 60% of the variation in free choice water intake. Allowing beef calves access to plenty of fresh water will improve dry matter intake, rumen development, and average daily gain. Temperature plays a very critical role in water intake in the young calf. This is especially true at high environmental temperatures as the relationship between temperature and water intake is exponential rather than linear. Dr. Quigley’s dairy calf research indicated that when calves were fed 2.2 lb/d dry matter at 32°F they consumed 0.37 gal/d of free choice water. If the temperature was increased to 59°F the calves consumed 0.53 gal/d and if the temperature was increased to 86° then water intake increased to 0.79 gal/d. These are still fairly mild temperatures. 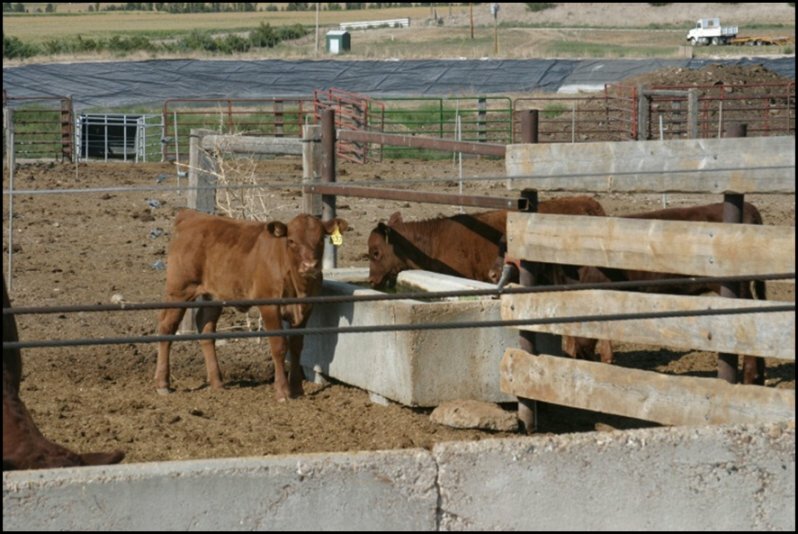 Young calves experiencing 90-100°F days would certainly need access to plenty of water. Calves born in the confinement cow study conducted by the University of Nebraska are born in July. At one day of age these calves exhibit the need for free choice water if the high temperature is above 90°F. Whether cows are confined or not, producers need to make sure calves can reach the water source and that the source adequately refills after cows drink to quickly make water available for the calves. Producers should supply 2-2.5 inches of linear drinking space per cow/calf pair to supply 16 minutes of drinking time every 4 hours. It may be necessary, in really hot conditions, to place tubs of water out of reach of the cows, but accessible to calves to prevent dehydration. Calves losing over 14% body water will most likely die. Therefore, adequate water is critically important. Beef cattle producers should pay careful attention to ensure water is accessible to young calves, particularly in the summer heat. Providing adequate water will increase calf health, encourage dry matter intake, and improve average daily gains.